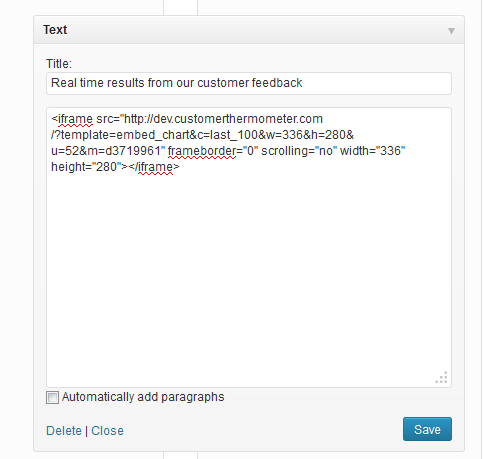 Customer Thermometer’s realtime results widgets allow you to publish (anonymous) statistics about your survey responses to the public. There are four types of widget currently available. They can be published to your website or to your Facebook page. Click the tabs below to learn more. Our first widget displays a pie chart splitting out the last x responses (where you can define x to be whatever number you wish!) you’ve received across either all results in your account OR you can choose to display results from a specific Blast. The widget is ‘live’ – every time a web page is refreshed with this code embedded, it will update and display your results in real time. You can see one of our customers using it on their Testimonial pages right here. To provide complete transparency to your customers, prospects and targets, and demonstrate your commitment to customer service. This widget and all future widgets are generated using an iFrame. This is exactly the same format people use to embed YouTube videos on their website. If you can embed a YouTube video, then you will easily be able to display this widget. Step 2 – click on REPORTING on the main navigation. Step 3b – to publish a widget which reflects a specific blast, firstly select the blast breakdown reporting for that blast, and then select the widget tab. Step 4 – to embed a chart, simply single click and copy and paste the HTML embed code into the relevant webpage (details below). If you are using a WordPress website, you can paste that code into a page (select the text tab as opposed to the visual tab first). You won’t need any special plugins or code. Choose the number of recent results you’d like to display by changing the parameter, x – shown in green below. You have the ability to resize it – by changing both width and height parameters within the code as shown below in red. Make sure both the widths are the same, as well both the heights. Please note that despite the code pulling in live data from your unique account details, there is no possible way for anyone to use this code to access your account, view your contact data or specific results. This widget purely provides a real time overview of the latest results in graphical form. 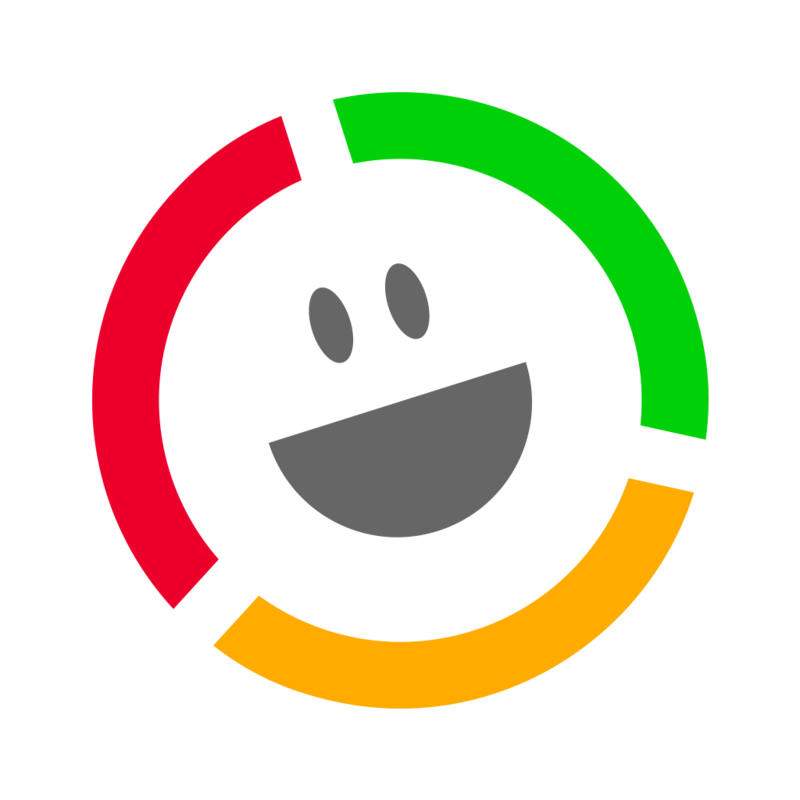 This widget displays a pie chart showing the split between Happy (Gold and Green clicks) vs Disappointed (Yellow and Red clicks) that you’ve received across either all Thermometers in your account OR you can choose to display results from a specific blast. Note this is identical to the graph in the blast breakdown screens. Now it’s available to all… It is ‘live’ – every time a web page is refreshed with this code embedded, it will update your results in real time. To provide complete transparency to your customers, prospects and targets, and demonstrate your customer service commitment. This widget and all future widgets are generated using an iFrame. This is exactly the same format people use to embed YouTube videos on their website. If you can embed a YouTube video, then you can display your results. You have the ability to resize it – by changing both width and height parameters within the code as shown below. Make sure both the widths are the same, as well both the heights. [Happy responses (Gold and Green clicks)] DIVIDED BY [Total responses] Expressed as a percentage. You can choose to display this for the total of all Thermometers in your account OR you can choose to display results from a specific blast. It is ‘live’ – every time a web page is refreshed with this code embedded, it will update your results in real time. The simple to use version looks like this. (See advance uses below). To provide complete transparency to your customers, prospects and targets.In theory, it could be the ultimate sales tool for you. By publishing your real time results – it focuses your team. You have the ability to resize it – by changing both of the width and height parameters within the code as shown below in red. These numbers are called hex. To work out which color you need and therefore which number you need to add – visit this w3schools.com page. Most users will be happy to embed this widget as an iFrame – which means there is no chance of styling it specifically to fit into the look and feel of a webpage. However, for more advanced users, we can offer the %age as a “number” which customers can use a server side script to pull from our API. Essentially you need to run a couple of lines of PHP on your site on page load which will return a number. You can then wrap it in a div and output to screen. Many servers have remote fopen (which that example uses) turned off. These numbers are called hex. To work out which colour you need and therefore which number you need to add – visit this w3schools.com page. 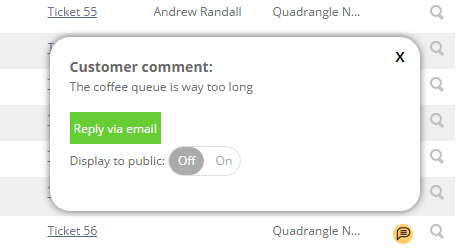 This widget displays a list of your recently received comments alongside the date and rating. Comments CAN BE MODERATED. There is explanation below on how to do this. Why not use it on your testimonials page? Step 2 – click on REPORTING on the main navigation. (Note: the comment widget is only available at account level not at an individual blast level). Step 3 – to embed it, simply single click and copy and paste the HTML embed code into the relevant webpage (details below). If you use Customer Thermometer’s widgets to display comments on public or internal websites, by default, all comments will be displayed. Note that any changes made will only apply going forwards. Comments with a public/private status will not be changed retrospectively. Note that those sliders will not appear, if Comment Moderation is switched off. 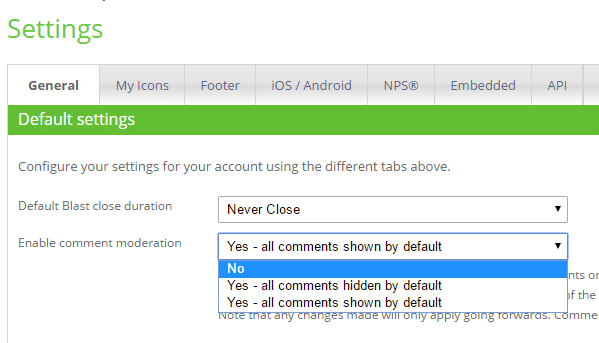 Choose the number of recent comments you’d like to display by changing the parameter, x – shown in green below. You can change the title displayed by changing the words in blue. Note %20 is the equivalent to a space. You can change the size – by changing both width and height parameters within the code as shown below in red. Make sure both the widths are the same, as well both the heights. You can also change the text color. This is an HTML color code. You can look them up here.